I was well on my way to making a mess of that cake. I nearly burnt the chocolate melting it on the stove because I was so distracted and anxious. I couldn’t follow the recipe or figure out whether I was supposed to cream the butter and then add the sugar and eggs, or vice versa. I was stiff and awkward in my own kitchen. My in-laws were coming for dinner, and chocolate cake is one of my father-in-law’s favorite desserts. I wanted so hard to get it just right. Stanley has Alzheimer’s disease, and he’d had a difficult afternoon in that paranoid, delusional kind of a way. We weren’t even sure if he would leave his house to join us for the meal. We just hoped. He’s in what they call “severe cognitive decline.” It’s the last stage before he loses all touch with the world. Soon, and nobody knows when, he won’t be able to respond or interact with his environment; his power of speech will be gone and so will be the control over his body. For all the years I’ve known my in-laws, they’ve been a pleasure to cook for. They appreciate good food, they’re interesting, engaged people, and Stanley always appreciates a good dinner and has an impish sweet tooth. At the end of every meal, he’d say, declaring to the table: “Alice, that was the best—(fill in the blank)—that I’ve ever had.” And we’d all laugh. It’s his standard line, he uses it every time, and even so, that flattery and his smile always get me. There is still something left of the man I know—I can see it in his eyes during a calm spell. Then something happens. I don’t know what or why, but he has these hallucinations. It might be an emotional reaction to something that didn’t happen or isn’t real. Like when his wife leaves for the market and he’s convinced she’s dead. Or he sees, hears, smells, or even tastes something that’s not there. These days at meals he asks what it is he’s eating while he’s eating it. He’ll chew and swallow and then ask again. The good thing is, at least, he’s still eating. Marge and Stan did make it over for dinner, and after dessert he declared right on cue that it was the best chocolate cake he’d ever had. And then he let out a whoop and a holler of pure delight and pleasure. It’s weird and maybe ironic—how the cruel, mental strangulation of Alzheimer’s has in a way, freed him to express exactly what he feels at any given moment, without boundaries or filters, even when he’s having horrifying thoughts. For all I know, he was tasting chocolate cake as if it was the first chocolate that he’d ever had in his life. Maybe I was seeing someone experience unadulterated joy at the simplest of things. Though it was just a moment. Right afterward, he pulled out his wallet and emptied its contents into his glass of water. My rage and helplessness against Alzheimer’s are futile, exhausting things, and there’s no one, nothing to blame. I wish there was. The next morning I had a slice of cake for breakfast. 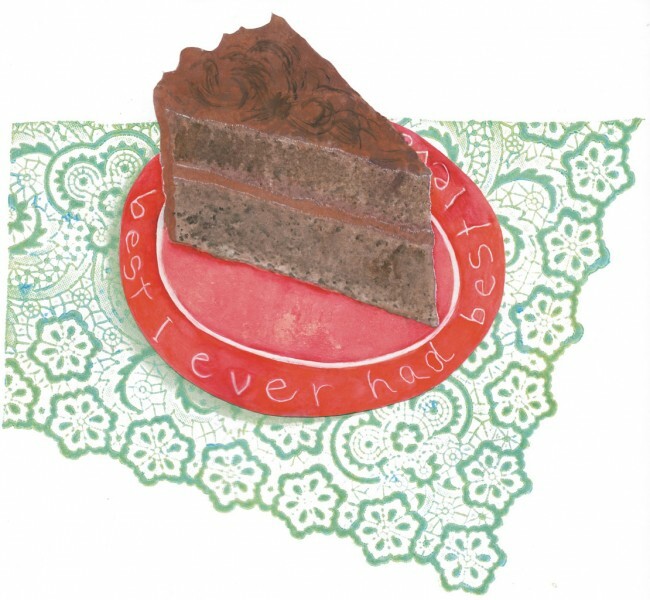 I closed my eyes and tried my best to taste it like it was the first chocolate cake that I’d ever had. But I couldn’t. All I could taste was dry and crumbling grief.